UK-based humanitarian relief agency made a special mission on Jan 3 to the depths of Gua Musang jungle in the midst of the Malaysian state of Kelantan to serve 11 Orang Asli settlements in its on-going flood relief efforts. 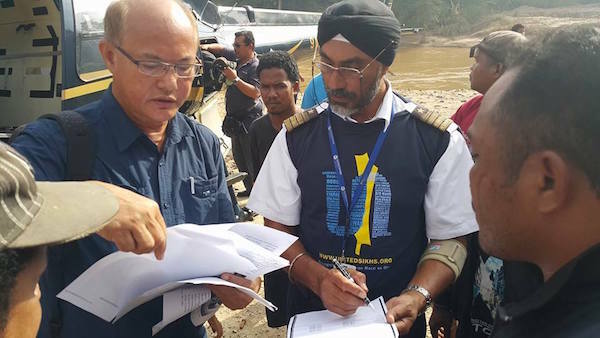 Its “Baaj of Humanity” was made possible by Helistar, a Malaysian-based helicopter company, based owned, operated and manned by an experienced Sikh pilot Capt Bagawan Singh, according to a statement from the agency. The helicopter took off from Subang, Selangor, with five men on board for the one-day mission to reach the affected villages deep in the jungles of Gua Musang. Kampung Betis was selected as the main pick up point for the mission, based on the scouting by the Center For Orang Asli Concerns (COAC), a non-government organisation (NGO) that facilitates Orang Asli initiatives at self-development and in defense of their rights. The helicopter carried 2,350kg of goods to close to 300 Kelamins (families) comprising of 1,000 people cut off from the outside world due to the landslides caused by heavy rain and heavy logging, the agency said in a statement date Jan 3. “In certain villages, they were without aid up to three months almost reaching to the point of severe desperation as their hill paddy and tapioca was destroyed in the recent floods,” it said. COAC coordinator Colin Nicholas, who was on board the mission, said in the same statement that its efforts for the past week to reach the villages were not successful, but the helicopter made it possible to perform the air drops.